A multiple shadow transit of Jupiter’s Galilean moons occurs on the night of 24 March. 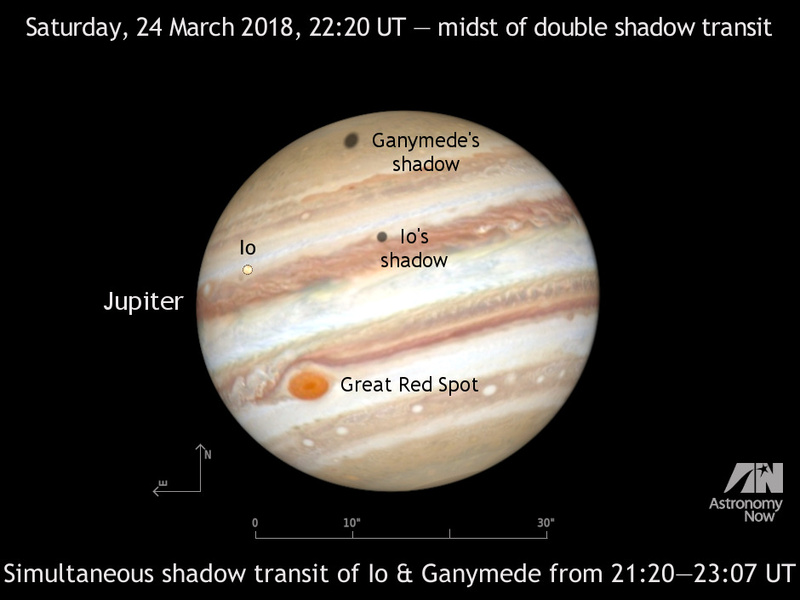 On this occasion the shadows of Io and Ganymede are cast upon the face of their parent planet from 21:20–23:07 UT. Observers in central and eastern Europe are favoured for this event since Jupiter does not rise until 11pm GMT in the UK. AN graphic by Ade Ashford/Cartes du Ciel. Observers in western Europe looking low in the southeast at local midnight (or 1am after daylight savings this weekend) can see Jupiter, the solar system’s largest planet. The gas giant is little more than six weeks from opposition, so now is the time to dust off your telescope and collimate (align) its optics so you can hone your observing skills – not just for Jupiter, but also for Mars at its closest for 15 years in late July. More on the Red Planet in due course. As befits the King of the Planets, Jupiter is accompanied by an impressive retinue of 69 natural satellites at the last count. The largest of these by far are the so-called Galilean moons — Io, Europa, Ganymede and Callisto — discovered by Galileo Galilei on 7 January 1610. Europa, the smallest of the ‘big four’, has a diameter slightly less than our own Moon, whereas the largest (Ganymede) exceeds planet Mercury in size. In fact, the Galilean moons are so conspicuous that quality binoculars will reveal them when farthest from their parent planet. 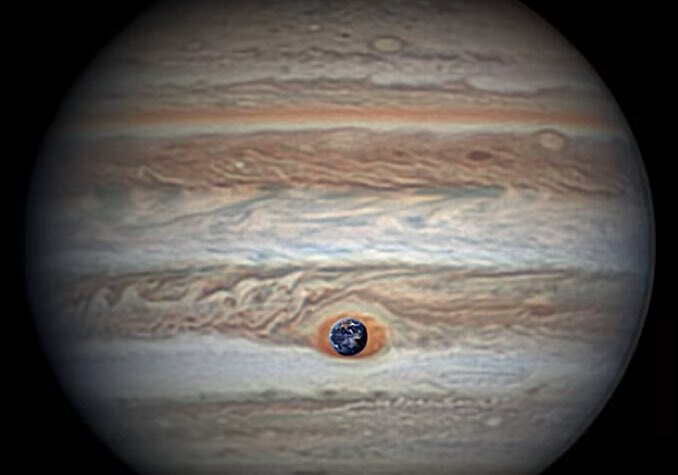 Io, Europa, Ganymede and Callisto continually play cat and mouse as their orbital motion cause them to alternately pass in front of (transit) Jupiter or be hidden (occulted) by their parent planet or its shadow. Furthermore, the shadows of the Galilean moons frequently fall on the cloud tops of Jupiter, visible in modest (3-inch, or 7½-centimetre aperture) telescopes of good quality at magnifications of 100× or more as inky black dots slowly drifting across the face of the planet. The so-called shadow transit of an individual Galilean moon is a relatively common occurrence, but when the viewing geometry and timing is just right, then we can view a series of simultaneous transits of two, or very rarely, three of Jupiter’s moons. The first of this year’s multiple shadow transits occurred on 5, 12, and 19 January with the next scheduled for 24 March, as illustrated above. The following table summarises the events for the remainder of this year with the start and end of the double shadow transit in 24-hour Universal Time (UT), equivalent (for our purposes) to Greenwich Mean Time (GMT): Don’t to forget to add one hour to the above time when daylight savings applies (25 March – 28 October 2018 in the UK). While studying Jupiter’s four big moons, don’t overlook the planet’s complex weather systems. The easiest cloud features to see (even in very small telescopes) are the North and South Equatorial Belts (NEB and SEB) — the two darker bands that lie either side of Jupiter’s equator. Owners of 6-inch (15-centimetre) aperture and larger telescopes may also wish to look for smaller structures and subtle colours in the planet’s ever-churning storms. Seeing will be the problem for observers in the UK since Jupiter lies just 20 degrees high in the south at opposition on 9 May. Another prominent Jovian weather feature to view is the Great Red Spot (GRS), an anticyclonic storm found just south of the SEB that is believed to have been in existence for at least 350 years (earliest observations by Giovanni Cassini date back to 1665). Although it is currently smaller than in recent years, the GRS presently makes up for that by taking on a distinctly reddish hue, making it easier to see in smaller instruments. The Great Red Spot is easiest to see when it crosses the imaginary line joining Jupiter’s north and south poles that passes through the centre of the planet’s disc. At such times we say that the GRS is ‘in transit’, though it’s well placed for observation for up to an hour or so either side of the transit time. For observers in Western Europe and the British Isles, conveniently observable transits of the Great Red Spot over the next fortnight occur on the following dates and times: In the UK, remember to add one hour to the times above from 25 March for daylight savings time. Predictions for the beginning and end times of individual Galilean shadow transits (which are more common than the double transits highlighted in this article), plus information on their eclipses and occultations for any given date or location in the world, may be obtained through our Almanac. Note that the Almanac’s predictions of Jovian phenomena use 24-hour Universal Time (UT) / Greenwich Mean Time (GMT). Always ensure that the Daylight Savings Time check-box is ticked if applicable to your date, time and location. For help using the Almanac, see this article. 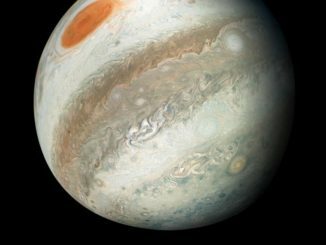 NASA’s Juno spacecraft is helping scientists learn more about the giant planet’s interior structure and the dynamo that powers its magnetic field, but citizen scientists are keeping the public up to date with stunning images providing unique views of the planet’s mesmerising clouds. 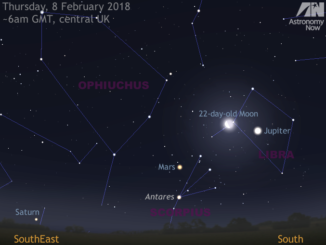 Set your alarm for 6am GMT if you wish to see three naked-eye planets in the UK dawn sky this week. Find a location that offers an unobstructed view of the horizon from southeast to south and let the waning Moon be your guide to locating Jupiter, Mars and Saturn on successive mornings from 7 to 11 February. Currently the third brightest celestial object in the night sky of the British Isles after the Moon and Venus, Jupiter presents a cornucopia of phenomena for observers with medium to large telescopes tonight.